Joe, you're being awkward again. Vice President Joe Biden forgot his sandwich money Friday. 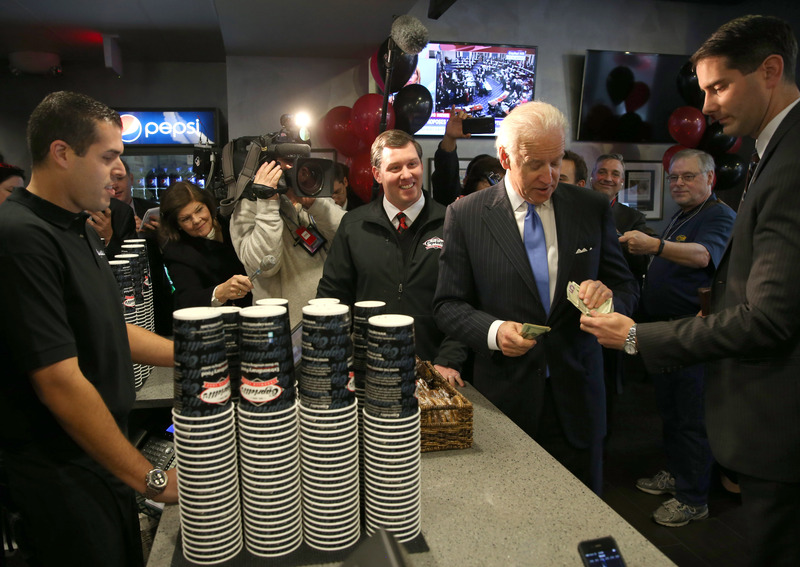 Biden was celebrating the opening of a Delaware-based sandwich shop's D.C. location, and decided to pick up some hoagies for himself and POTUS. But he didn't have any cash on hand, and had to borrow some from an aid. This isn’t really newsworthy, except for the fact that it’s Joe Biden, and this is exactly the kind of thing Biden would do. Biden's charmingly-awkward gaffes have earned him the love of some, the wrath of others, and even a parody autobiography. We thought we'd look back on some of the vice president's most delightful minor screw-ups, because it's the end of the week, and why not? Biden was giving a shout-out to Missouri State Senator Chuck Graham at a campaign rally in 2008. “Stand up, Chuck, let ‘em see ya!,’ Biden said, seemingly unaware that Graham is confined to a wheelchair, and therefore can’t stand up. “Oh, God love you, what am I talking about,” Biden said, recovering quickly. “I tell you what, stand up for chuck!,” the then-vice presidential candidate encouraged. The crowd acquiesced. In 2010, Biden incorrectly implied that the Irish Prime Minister’s mother was dead. “His mom lived in Long Island for ten years or so, God rest her soul, and, umm ... although, wait, your mom’s still alive, it was your dad who passed,” Biden said to laughter. “God bless her soul!” Because it was Joe Biden, everyone laughed, including the PM. “I know who runs the show,” Biden cracked to the guys. This was a reference to Roberts’ own flub on Inauguration Day, when he misspoke while administering the oath of office. Obama’s scowl was visible. Speaking of swearing in, Biden’s conduct early this year during the Senate swearing-in Ceremony was a cornucopia of awkwardness, with the vice president hitting on grandmothers, threatening to frisk Senators-elect and, at one point, complimenting a man’s pectoral muscles. All in jest, of course.